Can I Give Up SWEETS? Um, no. The thinnest I have been as an adult was during my vegan experiment. However, my hair was also falling out, so perhaps I wasn’t doing it quite right. Last night I was thinking that I should make another vegan effort. The thing is, I don’t think that meat is a problem for me. I don’t have the passion for saving animals. That sounds heartless, but I like to eat meat. I know where it comes from. I ate vegan just for health reasons. Pretty sure skinless chicken breasts aren’t making me fat. Yes, I gave up meat and all animal edibles, but I also gave up sweets and alcohol. So here I am again, facing my problem, my addiction, my passion: sugar. As I am writing this I have two tabs waiting for me to click them. The Minimalist Baker is calling me! 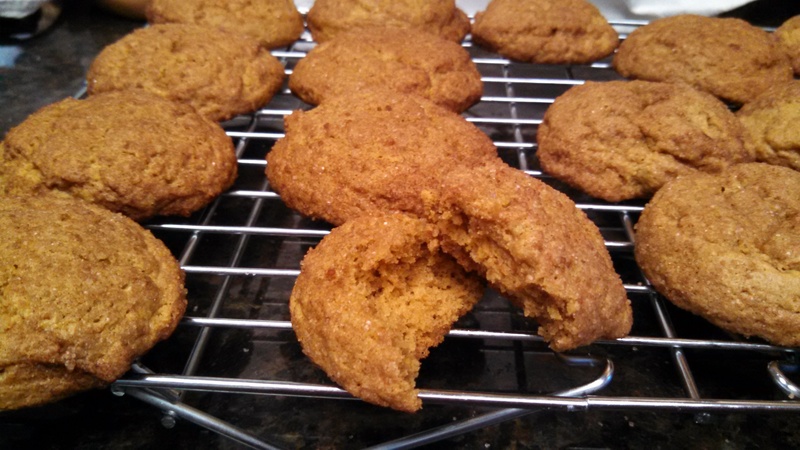 Vegan Pumpkin Sugar Cookies! AND Easy Raw Vegan Brownies! I want to make them so much and they are vegan! Doesn’t that count for something? Am I over-thinking this whole eating thing? No, I don’t think I am. Not over-thinking, but thinking the wrong way. I have a problem with eating sweets until they are gone. I can’t make a pan of brownies and eat one. I am greedy. Ooh, that is an ugly word! It’s true though, I don’t want to share my sweets. I want the first cookie out of the oven and I want the last one too. So, what do I do? Either, 1. give up all sweets (will work for a time, but not a permanent solution), 2. make healthier sweets (better, as long as I don’t eat the whole recipe, negating the healthy part) 3. make small batch recipes (again, I still have to pay attention. I got into trouble with “single serving” desserts. I ate a mug cake that was almost 700 calories. That is still less than Cheesecake Factory cheesecake, but as I will never eat that cheesecake…um…did I have a point?) 4. give sweets away (I can’t eat the sweets if they are not in my house). (My apologies to any grammarians reading this post.) New Plan! I will implement all of these ideas. I need to have sweet-free days. A dessert break, that sounds too good. A break from desserts. I know people who don’t eat sweets after every meal, they do exist. Every one has different temptations. I can walk past a slot machine and feel nothing. I cannot walk past a pan of brownies and feel nothing. Even though I know that I can never eat cheesecake, I still like to visit the cheesecakes at the Cheesecake Factory. They look so good in that case. I like to read the descriptions of them in the menu. Focus! How did I get hung up on the Cheesecake Factory? Stop saying cheesecake! Deep breath, drink of water. OK, moving on. I can make small batch, healthy dessert recipes and give them away. Good idea. 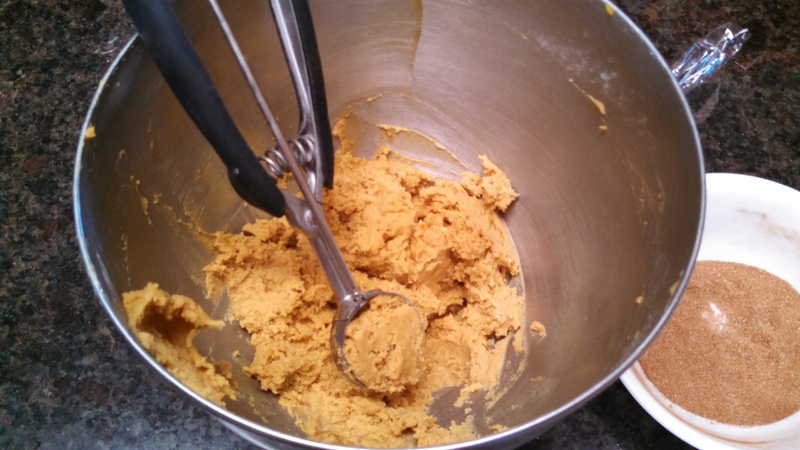 Let’s start with pumpkin sugar cookies! To make them a little more healthy, I halved the fat and added more pumpkin. One of my favorite muffin recipes Irresistible Double Chocolate Muffins, doesn’t have any added fat and uses pumpkin instead. I also used more whole wheat flour. Pretty sure I could use all WW pastry flour, but my kids might not eat them. Next objective: smaller batch, well 20 is a pretty small batch for cookies. Plus I am making these on Monday so that I can take most of them to Bible study Tuesday morning! I think that sounds pretty good. 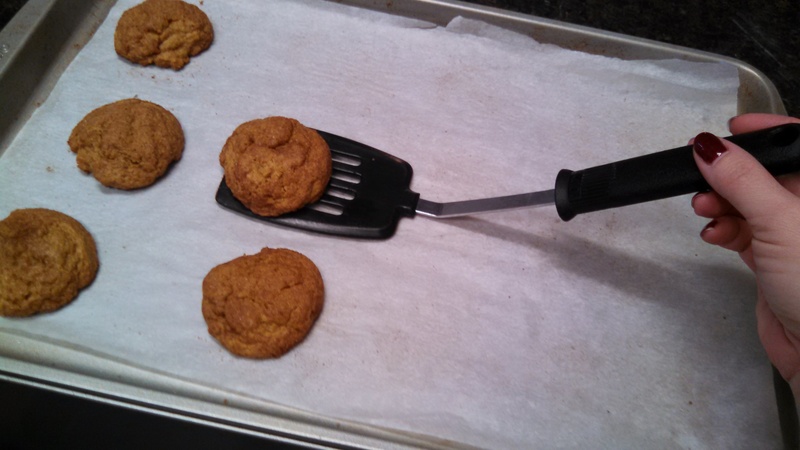 I decided to use a cookie scoop and not get my hands all gooey. A flat bottomed bowl works the best for the cinnamon and sugar. I always use parchment paper for easy clean-up. A picture of my hand. I always wanted to be a model. These would look so much better if I had any talent for photography or a camera. Both would probably be good. On to the recipe! Add butter or coconut oil, pumpkin and sugars to a large mixing bowl and cream with a mixer for 1 minute. Add corn starch, baking powder, baking soda, salt, pumpkin pie spice and 1/2 teaspoon of cinnamon, mix to combine. Add flours. Mix until incorporated, being careful not to over mix. Freeze dough for 15 minutes, or refrigerate for 30 minutes (or chill overnight), preheat your oven to 350 degrees F, and position a rack in the center of the oven. 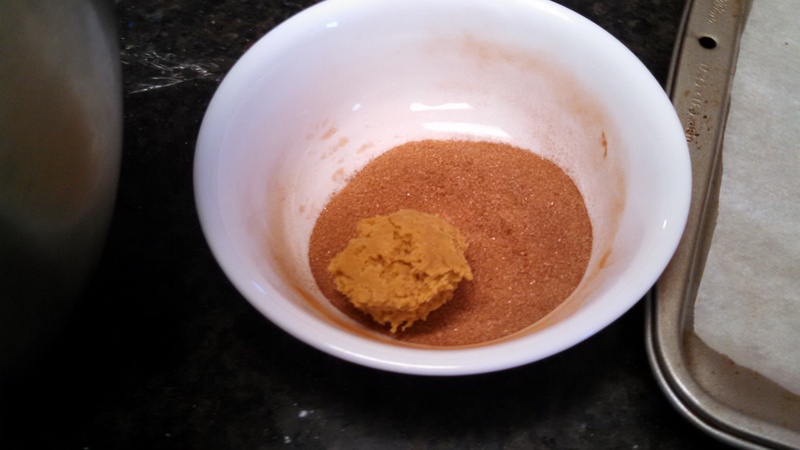 Mix 2 tablespoons of sugar and cinnamon in a small bowl. 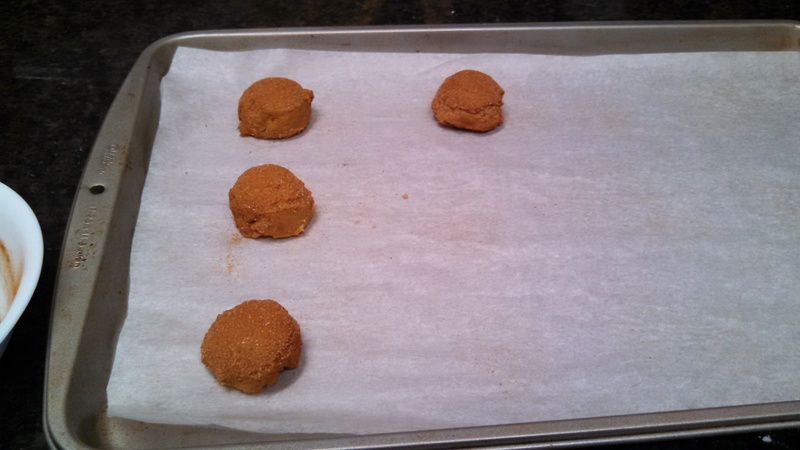 Scoop out heaping 1 Tbsp amounts of dough and roll into balls (it will be sticky) or use a cookie scoop. Swirl dough in cinnamon sugar to coat and place on a baking sheet 2 inches apart to allow for spreading. Bake on the center rack for 10-14 minutes, depending on how you like your cookies. Let rest on pan for a few minutes, then transfer to a cooling rack to cool completely. These stay puffy and are a bit cakey. I’ve only eaten two three, you know for research.